The Eucharist and the Paleo diet- now those are two ideas that I never thought would be connected. Of course, at this point in my life, I should not be surprised by anything I hear. And yet, this past weekend, a simple declaration left me speechless. And let me just tell you- in this job, there is very few situations that will leave me without words. I have a response, or at least a retort, for everything that comes out of my students’ mouths. Even my parents generally do not succeed in stumping me. But this one did. This parent made the impossible happen: I had absolutely nothing to say. For once in my life, I was at a loss for words. A few weeks ago, my co-workers and I were discussing allergies over lunch. More and more schools in the area are becoming “allergy-friendly,” meaning children cannot bring foods that contain common allergens, particularly peanuts. Over the course of the conversation, we touched upon gluten allergies, and how prevalent they have become over just the past few years. Whereas the condition seemed to be relatively unheard of even a decade ago, today nearly every grade has at least one child who has Celiac Disease, or some sort of gluten intolerance. This was most noticeable in preparing for First Communions. In the past, our Religious Ed office could go years without having a single child with dietary needs, and it was rare that we had to request gluten-free hosts for the children. Nowadays, we have at least one child each year, and more often than not, it’s more than one. I was dumbfounded. Shocked. Disbelieving. And absolutely disturbed by what I had heard. Could there really be people out there that are so enslaved to the Paleo diet that they must insist on gluten-free hosts? Can they not be satisfied with the Bread of Life as He usually comes down to us? Are there people who actually insist on gluten-free hosts- or worse, opt not to consume Christ’s Body and Blood in the form of bread- because they subscribe to the Paleo diet? Do these people really believe that it is more important that they avoid gluten at all costs rather than take part in the Eucharist in its natural, gluten-containing form? The comment probably angered more than it necessarily should have, but I found myself so annoyed by it that I could not speak. I couldn’t even communicate why this all seemed so wrong. Their choice to abstain from gluten did not affect me. It did not hinder my own reception of the Eucharist. To be completely honest, this was the least of my worries. The First Communion Mass was about to begin, and not all of our children had arrived yet. I had other things to worry about, and the gluten-free hosts were shoved to the back of my mind. But it was still there. And I was still bothered. I’ve known the frustrations that come with Celiac disease. I’ve had friends who must either receive the Eucharist only under the species of wine, or else not at all, when gluten-free hosts are not available. I’ve known children who are only permitted to receive the Eucharist from their mothers, because they can’t run the risk that another Eucharistic Minister or priest might give them Communion with contaminated hands. I’ve seen the extra thought that must go into preparing meals that are gluten-free and still appetizing. Even I have known what it feels like to be deprived of gluten-laden foods like bread and pasta because of dietary restrictions. My own health concerns, and my joy at being able to receive Jesus Christ in the Eucharist at any time, made me fully appreciate the gift of the Eucharist, but also pity those who are not so fortunate as me. And maybe that was why this person’s decision bothered me so much. Here was a woman who had chosen to abstain from gluten, even if it meant refraining from participating in the Eucharist. I just could not fathom such a decision, not when it wasn’t completely necessary. Not when there were other options. How could someone be given the amazing gift of the Body and Blood of Christ, and then choose not to accept it? After a while, my frustration settled, and I realized more than anything, I pitied the woman. She was enslaved. She was so completely bound to this diet that she could not even break away from it to receive the Body and Blood of Christ. Rather than receiving the Eucharist, she opted to receive a blessing from the priest when gluten-free hosts were not available. Now, I know of men and women who must receive a blessing and not the Eucharist, but it is not their choice. If it was up to them, of course they would choose the Eucharist. How could they not? I know that these men and women are out there and that their struggles are real, but now I know something that I didn’t know before. There are also men and women who actually choose not to receive Jesus rather than choosing to consume the Eucharist in its natural, gluten-containing form. I could barely bring myself to believe such a reality. But it’s true. There are some people who are so enslaved to this Paleo diet that they cannot even bring themselves to break it to receive the Eucharist. Their diets are their lives, and to break away is impossible. 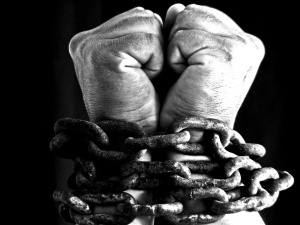 But because they are so enslaved, they are depriving themselves of the Bread of Life. Bread has been fundamental in the lives of human beings since the beginning of history. Man has consumed bread for millennia, but it has also been much more than just a type of food. It was essential to sacrifices, and wheat was one of the many things that were offered to God. Bread was not offered because man did not have any need of it, but because it was equated with life. When the Hebrews escaped Egypt, they packed unleavened bread. When the Jews were lost in the wilderness, traveling to the Promised Land, God blessed them with manna so that they would not starve. He did not just give them any sort of food- He gave them bread. 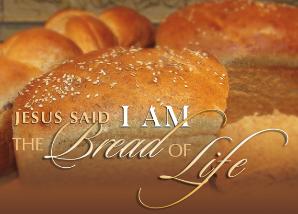 One of the most commonly used subject for parables was wheat, and of course Jesus Christ went so far to call Himself the Bread of Life. On the night before He died, He gathered His apostles and they broke bread together. He gave it to His disciples, but He was not giving them mere bread. He was giving them His Body. He could have chosen other food sources to transform into His Body, but He chose bread. He chose this food that has always been equated with life, since the beginning of time. 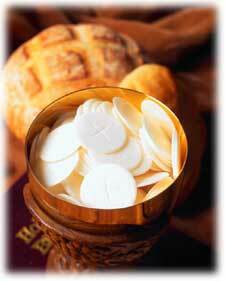 Jesus Christ is the Bread of Life, and anyone who willingly chooses their diet over the Eucharist is to be pitied. It is devastating that anyone should be so enslaved to food that they should choose to deprive themselves of the food that came down from heaven. When you are offered the choice between a diet and God, in a real way, you are choosing between death and life, and I pray that we will all come to choose life. Nothing should keep us from the Bread of Life, and certainly not a diet. Eternal life is worth so much more.